In the border of New Jersey and Pennsylvania lies a water gap that is surrounded by grassy beaches and forested mountains, the Delaware Water Gap. 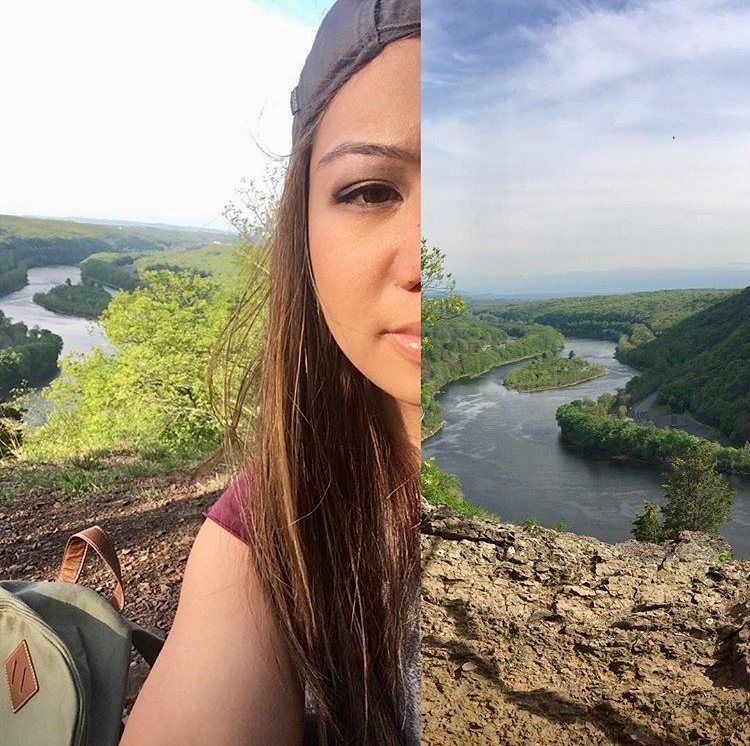 The Delaware Water Gap National Recreation Area offers a lot of outdoors activities for families and friends from hiking, fishing, biking, boating, camping, kayaking, and tubing — one of the things I got to do a few weeks ago. It is a vacation destination and attracts many visitors to be able to do these activities and 2 years ago, I came around the same area to hike Mt. Tammany, a mountain located above the water gap and overlooks it. 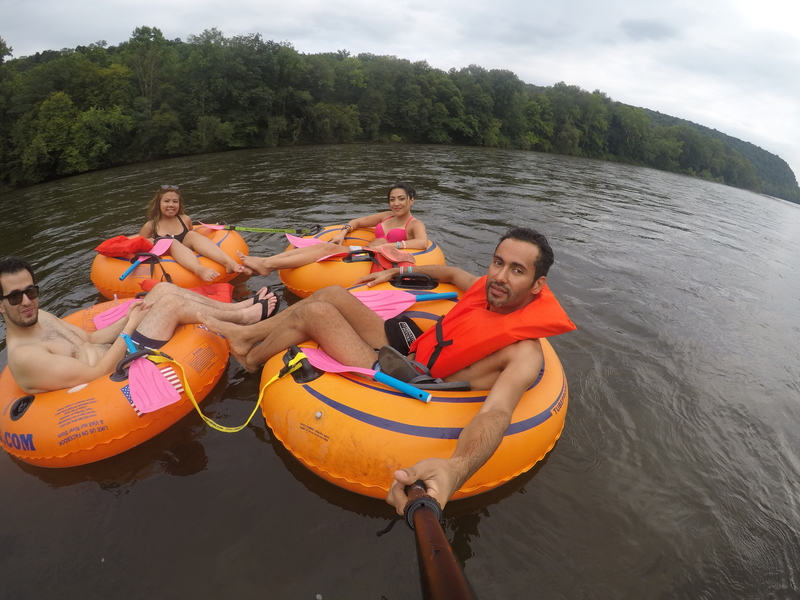 Tubing on the Delaware was a unique experience that I was lucky to finally experience this summer. 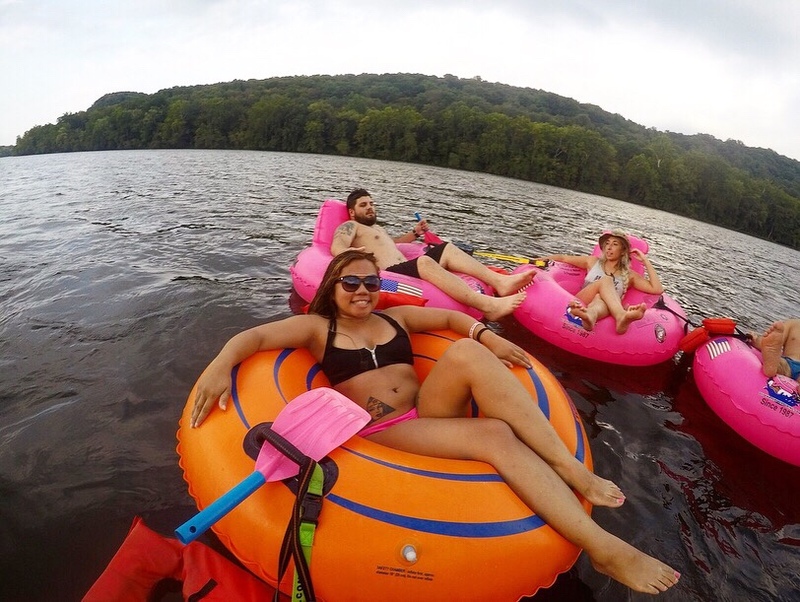 My friends and I have had plans since last summer to do this experience and when we all finally decided on a date, we took a road trip that day out to Milford, NJ, just roughly an hour from home, to get out and do some tubing. 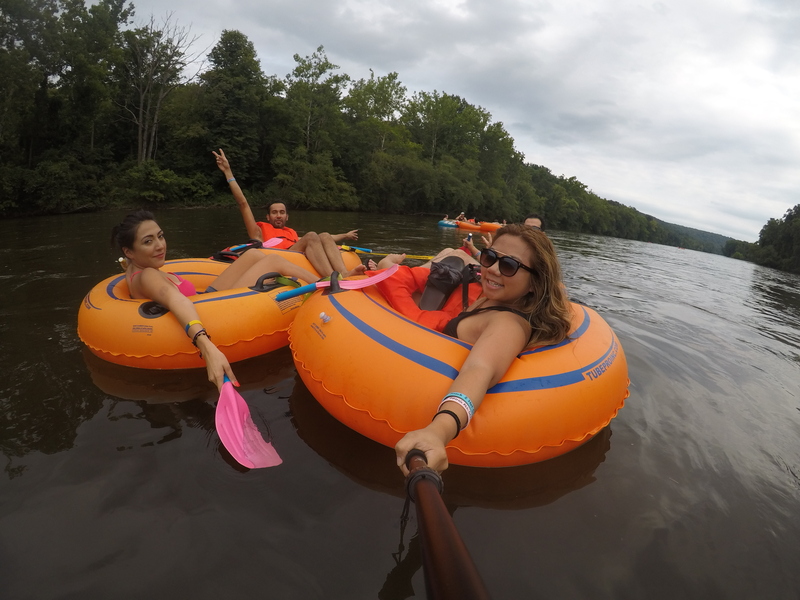 Besides tubing, there are other options you can choose from to be able to adventure the Delaware Water Gap: rafting, kayaking, or canoeing. I highly recommend that you go more on a weekday during peak season to save or to check out for some Groupon deals. We arrived to the base of the Delaware River Tubing company, which is used to check in, change (there is a bus that serves as a changing/dressing room), gather your tubes and life jackets, and to hop on a shuttle. Once we did all that, we hopped onto a shuttle, which took us farther away from the base to the actual river. 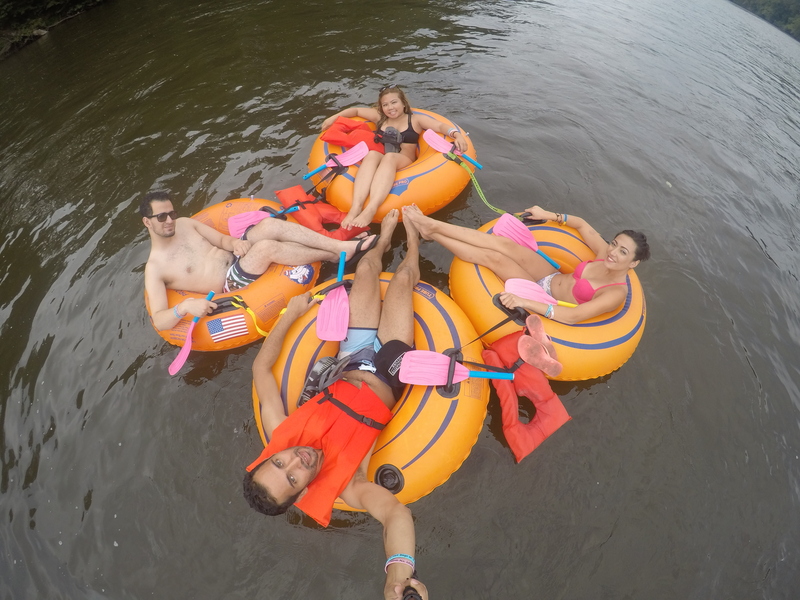 We carried our tubes and walked off to these wooden steps that connect you out to the river and laid our tubes out and laid on them. 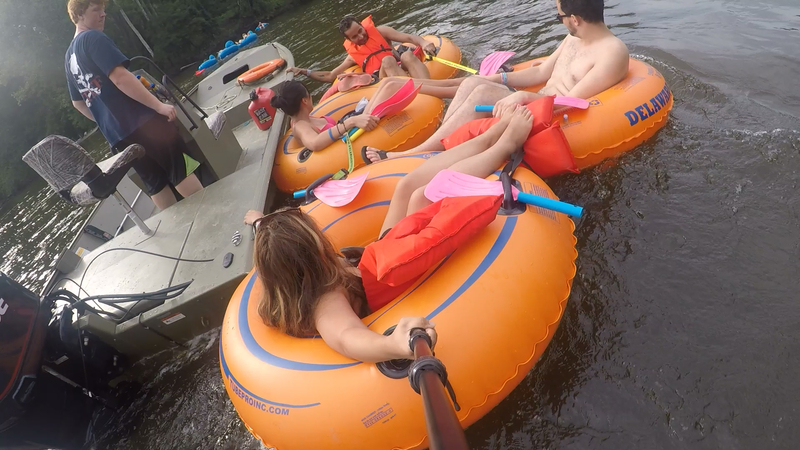 My friends and I did not want to get separated from each other since it’s easy to float away in the current, so we asked for stay-together-straps and tied ourselves together. We had paddle sticks with us to help with paddling ourselves in the river since the current is actually not as fast as I thought it would be. 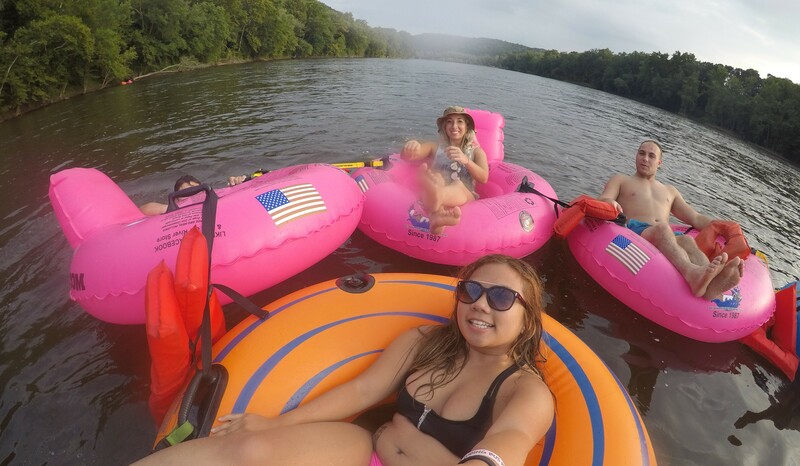 Throughout the tubing, we were told there would be an island that would have the “Famous River Hot Dog Man”, a floating area that would serve free BBQ food according to the deal of the tubing package. Since we were about to pass the place and were stuck closer to the other side, a worker in a boat recommended we hold onto his boat to drag us over to the island. 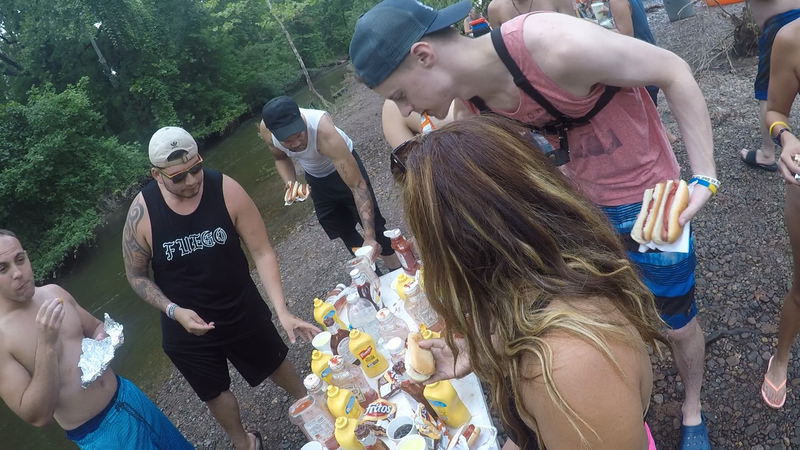 There was no landmark or appearance of a hot dog man but instead floating booths that had workers serve the BBQ food of your choice (2 hotdogs or a hamburger) with a free drink and snacks to take. 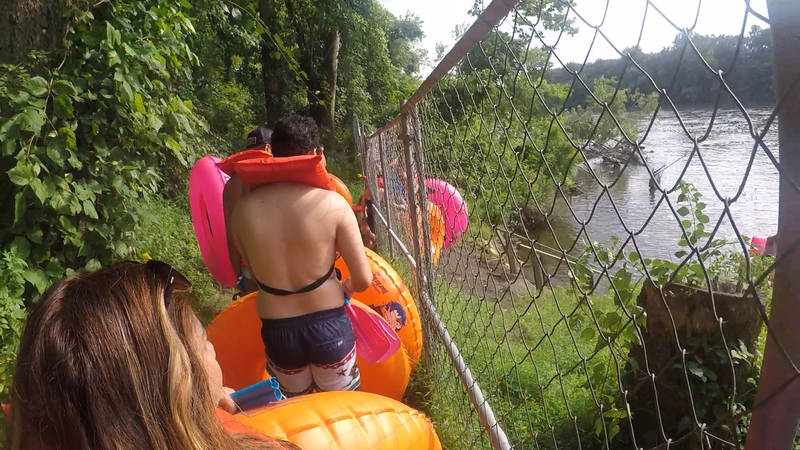 By there, we met up with our other group of friends and after eating, we decided to connect straps of our tubes with theirs and floated away together for the rest of the time towards the end of the exit. 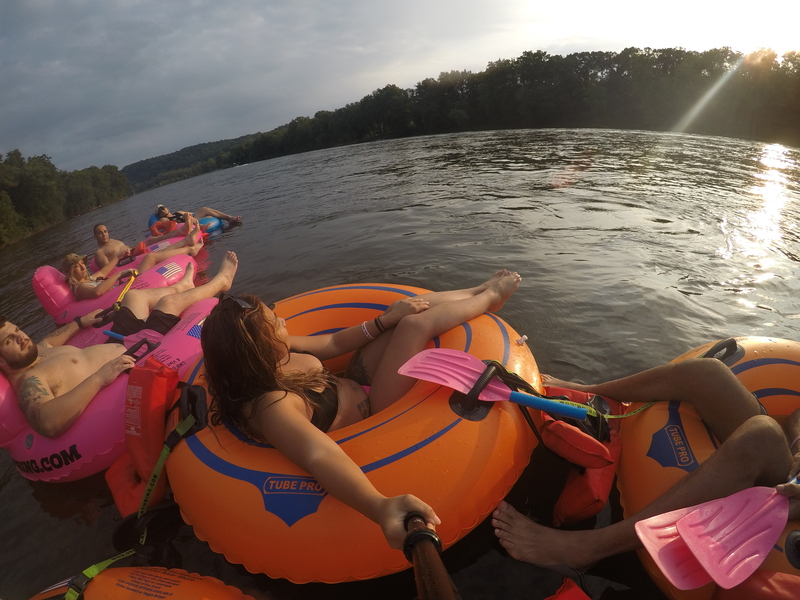 Some of us swam in the river current, we passed by rapids, and witnessed a beautiful sunset while relaxing on our tubes. Since your phone is most likely to get wet or can easily fall off, we did not take our phones to capture photos but I took my GoPro to record some videos and take some photos. 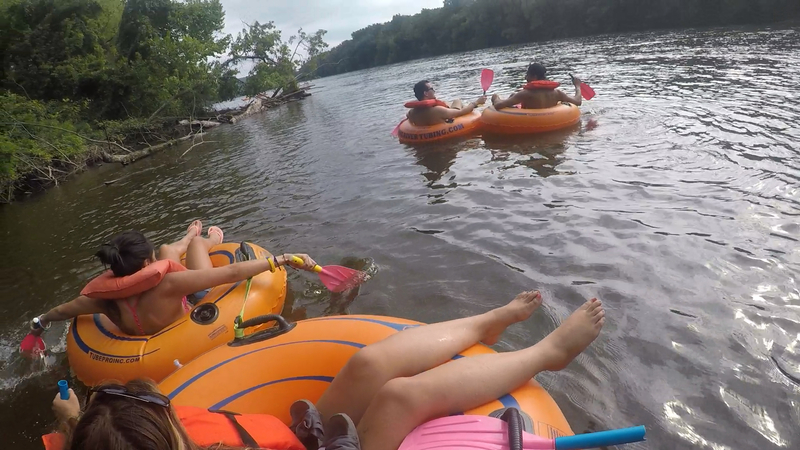 If you want to take your personal belongings with you to the river while tubing, which I do NOT highly recommend, try to keep your phone in a waterproof case or in a waterproof pouch. There are also outdoor watertight boxes that you can attach to your tubes. I also do not recommend you bring other pieces of your clothes (my friend’s pair of shorts with $5 in it floated away and got lost into the river) and your shoes. However, if you must bring your shoes like we all did (because who wants to walk barefoot on the roads/dirt?? ), attach them securely in between your life jackets or stay-together-straps. Also, if you do not know how to swim at all and depending on the river levels, do not take off your life jacket! It’s easy to be put into a dangerous situation so quickly and easy to drown in these rivers. 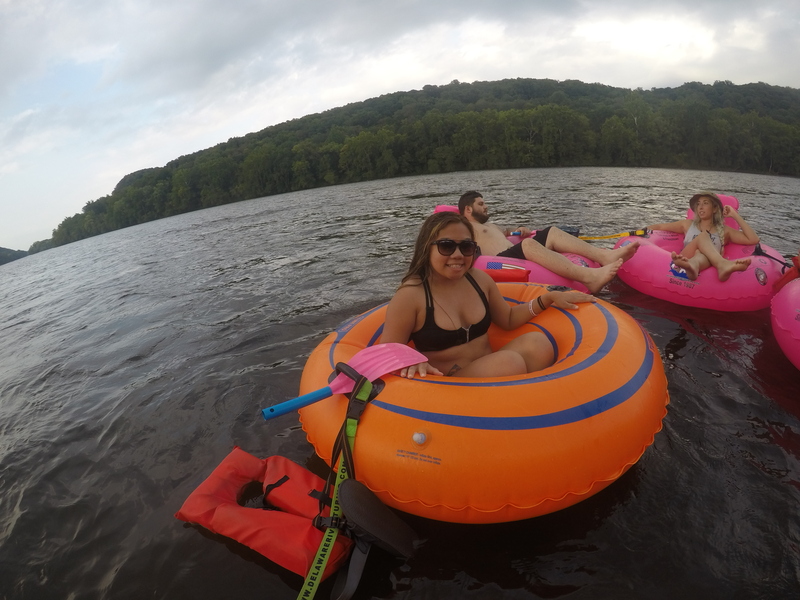 To sum it up, Delaware River/Delaware Water Gap tubing is a fun summer activity you must try if you ever come for a visit in the Northern New Jersey area! Serviced by the National Park Service, this historic, one-of-a-kind area is a known symbol of New Jersey’s wild nature side.